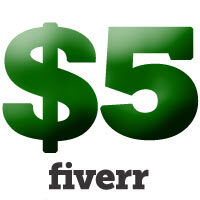 Over the last 2 months I have been doing work on Fiverr and made some cashflow with it. Not bad. In fact this is my Fiverr profile and you can see what I offer. I enjoy it for the most part. If you look at it you can see my most popular gigs are blog and forum posting. I have posted on some pretty interesting forums, and commented on some insightful blog posts. I usually like to interact with the buyers but I have come in contact with a few that were obviously lacking common sense like the majority of people in this world. So this should not be surprising really. One thing that really bothers me is that the majority of people who want to buy a forum posting gig do not ask if I am able to post on a forum which covers a topic that I may know nothing about. Thankfully for the most part, after doing some research I have been able to fulfill most of their orders and they were happy with my work anyway. However there were two buyers who really should have asked me if I was able to post on their forums before buying. One forum was about US Law (and I know little about law to begin with and not to mention I am Canadian) and the other had a forum on unusual investing tactics which I know nothing about. So these buyers bought forum gigs from me and I knew I was not going to get a good rating if I had fulfilled it. But I figured I would give it a shot anyway. I attempted to work on the investing forum but the login and password that the buyer gave me downright did not work. And I told him this in a message. He got mad at me and said that I must have not been reading it properly because it worked on his end. Ummm hello, I had copied and pasted what he had given me. Then I told him that I know very little of this topic and will do my best if he gives me the right login info. Well he decided to dispute it and I immediately gave him the refund. Geez, but I was glad to have been spared that burden. For the buyer who wanted me to post on his US Law forum, well I did some research on the topic and found other US Law forums to get ideas from and I did. But then the buyer messages me and says he does not like my posts and asks for a refund. I gladly gave it to him. Geez, why did they not ask me if I could post on their forums before buying??? That is what I don’t get. Assuming is the worst thing that anyone can do. But I think what I am going to edit my profile and tell potential buyers to ask me if I can work on their forums before buying because obviously there are plenty of people who don’t think ahead to do that. I have outsourced many things on Fiverr and I have been happy for the most part with what I have gotten. However there was one bad experience I had with a top rated seller! And yes I always look at someone’s rating before buying. They don’t have to have a perfect score because there are always disgruntled buyers for whatever reason. But as long as they have a very good score I will buy from them. But even the best rated sellers will mess up. I purchased a gig from someone who could style up my powerpoint presentation for my business. The turnaround time was 10 days and that is fair enough. I mean I am very busy and my turn around time for my gigs (except for the ones that take 2 minutes to do) are give or take 2 weeks. But by day 9 I had not heard from him (these sellers will usually update you and let you know the status during the time you are waiting). But I was shocked that he did not considering he was supposedly very good. And then I contacted him and asked him what the status of the gig was. He said that he knew nothing of the nature of the business I am in and had no idea how to work on my powerpoint presentation. Oh my gosh I was so mad and he refunded me. I mean I told him after that if he had told me this from the get go I would have been happy to work with him. I mean I realize people make mistakes but this was a HUGE mistake from someone who was supposedly a best rated seller who had glowing feedback from other buyers. And I am sure I will encounter more sellers like this but overall I have to say the quality of the work I had outsourced is quite good. I appreciate your participation to this site. I agree with you but somehow fiverr never worked for me, i always got scammed and wasted my money there. Now I prefer SEOClerks.com, its a site like fiverr but focused only SEO and website related stuff. You can find high quality seo gigs at most affordable prices. Take a look to it, you wont regret. Thanks Emma, I will check it out!